F4 help values, Key & Text display is standard feature in SAP however in Embedded Analytics reports (Custom ABAP CDS views Development) these two functionalities will not come by default. This blog will help how to leverage these functionalities in custom developed reports in Embedded Analytics. For custom developed ABAP CDS views based reports in Embedded Analytics F4 help values, Key & Text display was not appearing in reports by default as in ABAP reports or in BW reports. Follow the below steps to leverage these two standard functionalities in Embedded Analytics reports. Prerequisite: In this blog we are using standard Basic Views to bring F4 help values, Key & Text usage in reports. By default highlighted annotations should be there in the standard ABAP CDS views if not add these two annotations to leverage F4 help values, Key & Text display in reports. When dimension (Material) is inherited from custom/standard CDS view in the basic/composite CDS view. Report should show F4 help values, Key & Text display. In the basic CDS view Material should come from I_PurchasingDocumentItem hence association is created in the standard CDS view. In I_PurchasingDocumentItem CDS view I_Material is already associated hence it is not required to associate separately with I_Material in our CDS view, directly we can consume those associations in our views as mentioned below. This is required because we are directly bringing the text in composite view hence the below code is mandatory. In the composite view mention the below highlighted annotations so that text can derive from the Basic view (Step 1). 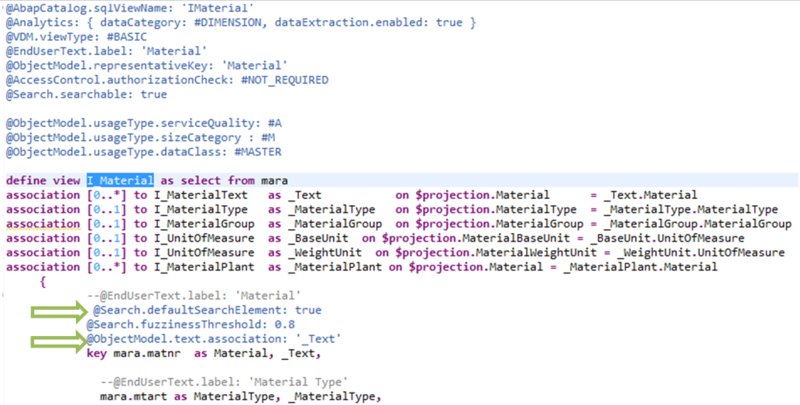 In Consumption view mention the query display as Key and Text as mentioned below. Now run the report in RSRT or Analysis Office, highlighted (Yellow) is text for Material which wasn’t appearing earlier. When dimension (GL Account) is coming from table, report should have F4 help values, Key & Text display. Here GL Account number is directly coming from EKKN table. Mention the foreign key association as mentioned below. GL Account number is coming from table hence we need to separately associate GL Account to bring the F4 help value hence the standard CDS view I_GLAccount is used in our composite view. GL Account F4 help value need to display Text as well hence in the composite view we have mentioned the association name. No need to mention the association name next to GL Account Number as mentioned in Scenario 1 (Step2) because here we are explicitly associating GL Account basic view in the composite view hence it is not required. In Consumption view mention the query display as Key and Text. Run the report through RSRT or Analysis office, earlier F4 help for GL Account wasn’t appearing earlier. As GL account standard ABAP CDS view will bring text, we have enabled the text in our CDS view so report will display the text as well. Highlighted (Yellow) columns are text fields in report which wasn’t appearing earlier. When dimension (Document Year) is coming from table, report should have F4 help values no need of Key & Text display. Here Material Document Year is directly coming from EKBE table in our basic view. Material Document Year is coming from table hence we need to separately associate Document Year in composite view to bring the F4 help value hence the standard ABAP CDS view I_CalendarYear is used. In Consumption view mention your selection prompt annotations. Run the report through RSRT or Analysis office, earlier F4 help for Document Year wasn’t appearing earlier. F4 help values, Key & Text display in reports require separate annotation enable in the custom CDS views models. Text annotations should be enabled in the standard CDS views if it is not already so that it can be leveraged in custom ABAP CDS models. When there is no standard text CDS view then custom text ABAP CDS views are required to develop.